This recipe is clearly inspired by the colors and flavors of the season. 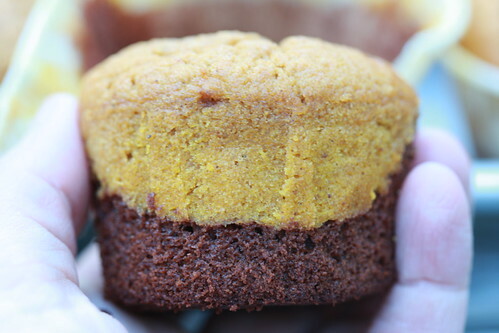 To be honest, on a day filled with candy and chocolate, pumpkin cupcakes are almost too much. 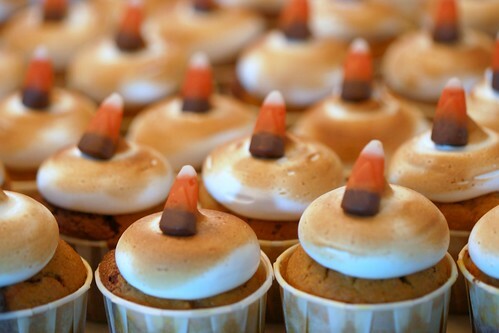 So while these were inspired by and for Halloween, I would skip it and try them for Thanksgiving instead. I used a rich chocolate recipe to stand up to the heavy pumpkin recipe. I was half hoping the layers would stay fairly even, but somewhat expected that they wouldn’t. It looked like the chocolate batter was desperately trying to rise to the top with the pumpkin doing its best to keep it down. What resulted was evidence of the struggle with a wave pattern along the side of the cupcake and just a touch of chocolate poking through the top. The pumpkin batter (adapted from a Martha Stewart recipe) is nicely spicy with a pleasant moistness. It was a nice partner to the chocolate and the overall result has a spicy outcome. The frosting provides some added sweetness and visual interest. These recipes work well for doing a two layered cupcake. One is mixed with an electric mixer and the other by hand. I can’t stress enough that you should pre-measure all ingredients and have them ready to go. Yes, you will dirty up a bunch of little bowls or plates, but it’s really the only way to ensure success. I measured out everything for both cupcake recipes and set them aside in order of use. I then mixed up the chocolate cupcake batter as it takes the longest. The pumpkin batter takes no time at all once everything is measured out. Just whisk together dry, whisk together wet, and whisk it all together. And don’t forget to preheat your oven to 375! 1. In a medium bowl, whisk together flour, baking soda, baking powder, salt, cinnamon, ginger, nutmeg, and allspice. 2. In a large bowl, whisk together, brown sugar, granulated sugar, butter, eggs, and pumpkin puree. 3. Add dry ingredients to the wet and whisk until smooth. 2. Scoop chocolate batter to fill cupcake cups 1/3 full. 3. Cover with the pumpkin batter up to 2/3 full. 4. Transfer to the oven, turn the oven down to 350 F, and bake for ~22-25 minutes or until a toothpick comes out clean. 5. Remove from the oven and allow to cool on a baking rack. 6. Once fully cooled, frost with meringue frosting and toast with a blow torch. Toasting is optional. 7. Top with candy corn, candy pumpkin, or whatever you wish. another job well done, and welcome back! These are painfully adorable! I venture to say they would make a candy corn lover out of even the biggest critic. I am soexcited that you have started posting again! This was my favourite, favourite, favourite blog and I mourned its closure terribly, though it did inspire me to start a blog myself. I’ve never tried toasting the meringue frosting before. These cupcakes look (and most likely taste) great! ooooh I love figs and these cupcakes look amazing! Hi! I love your blog! 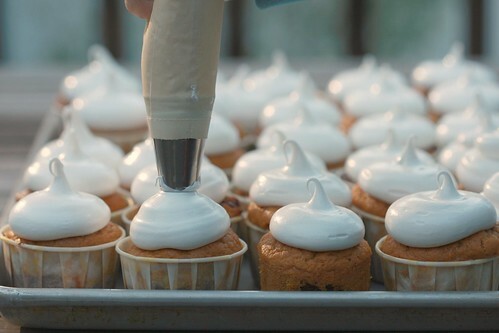 Question: do you think it is possible to layer any types of cupcake recipes? Thanks. Love your blog. I have never tried the meringue frosting before, can the meringue be coloured? I’m thinking pink and blue. Lovin your blog. I have never tried meringue frosting, can he meringue be coloured? These would be great for wedding around thanksgiving time or in the autumn especially if the couple were passionate gardeners, environmentalists or other outdoorsy types. They look gorgeous by the way.